The discovery of an icy asteroid in space could help explain how Earth got its water. (CNN) -- An icy asteroid orbiting the sun between Mars and Saturn is adding credence to theories that Earth's water was delivered from space, according to a report published in the new issue of the science journal Nature. 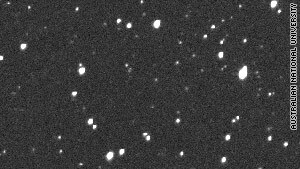 Two teams of scientists found their evidence when looking at 24 Themis, a asteroid about 479 million kilometers (300 million miles) from the sun, or roughly three times the average distance from Earth to the sun. Using the infrared telescope at Mauna Kea, Hawaii, they were surprised to find not only water on 24 Themis, but organic compounds as well. Asteroids were thought to be devoid of water because they sit too close to the sun, while comets have been the water bearers of the universe because they form farther out in space. "Astronomers have looked at dozens of asteroids with this technique, but this is the first time we've seen ice on the surface and organics," astronomer Andrew Rivkin of the Johns Hopkins University Applied Physics Laboratory in Laurel, Maryland, told Nature.com. The scientific teams from Johns Hopkins and the University of Central Florida that looked at 24 Themis speculate that the ice may be held in a reservoir under the asteroid's surface. They speculate that the water is brought to the surface as small bodies in the asteroid belt hit the surface of 24 Themis. The findings on 24 Themis lend weight to the idea that asteroids and comets are the source of Earth's water and organic material. Geochemists believe that early Earth went through a molten phase that would have removed any organic molecules, meaning any new organic material would have had to come to the planet at a later time, said Humberto Campins at UCF. "I believe our findings are linked to the origin of life on Earth," he added. Scientists now plan to scan the asteroid belt for more evidence of water and organic materials, hoping to determine if 24 Themis is just an interloper -- possibly a comet that got caught in the asteroid belt -- or the first of many water-bearing asteroids that will change the way astronomers look at the solar system. "The old-fashioned picture of the solar system in which asteroids are asteroids and comets are comets is getting harder to sustain," Rivkin said.